April 7, 2008: A wide group of Russian opposition leaders, human rights activists and celebrities have sent an open letter to the authorities of Latvia, requesting objectivity in the investigation against Vladimir Linderman, a columnist and opposition leader deported by Russian authorities. Linderman, who writes as “Vladimir Abel” in a variety of print and online media, is currently imprisoned on charges of possessing explosives, and of plotting an assassination attempt against Latvia’s former president in 2002. The authors of the letter claim the charges are “politically motivated and unsubstantiated,” and that Linderman was targeted by Russian law enforcement for his active roles in The Other Russia coalition and the banned National Bolshevik Party. The letter was originally signed by 24 persons, and is now gathering further signatures online. We are appealing to you in connection with the situation surrounding Vladimir Ilyich Linderman, a non-Latvian citizen. 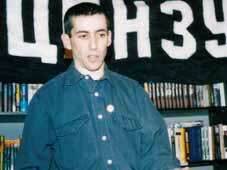 At the present moment, since March 20th 2008, V. I. Linderman has been held in a temporary detention facility in Riga. He was deported from Russia to Latvia on March 19th, after a ruling by the Izmailovsky court in Moscow. On March 20th 2008, the Latvian prosecutor’s office filed charges again Vladimir Linderman. He is accused of storing explosives and of calling for the overthrow of the political system. We have reason to believe that the current charges are politically motivated and unsubstantiated. Firstly, back in 2004, the court dropped charges, on grounds of lack of evidence, against A. Petrov, O. Morozova, and R. Krumgold, who were involved in the same case as Linderman, and were accused of storing explosives and calling for the overthrow of the political system. Secondly, some of the publicly known details used to charge Linderman are astonishing. For instance, the fact that during a search of his apartment, a TNT block with a detonator was supposedly found in an armchair that his ten-year-old daughter had a habit of jumping on. Further, we want to note that the work and thoughts of Vladimir Linderman were connected exclusively with Russia in all the past years. Precisely in Russia did V. Linderman become one of the [physical] and ideological leaders of The Other Russia political coalition. The coalition advocates non-violent struggle for the restoration of democratic institutions in Russia, starting with the institution of free and fair elections. In the past few years, dozens of Vladimir Linderman’s articles, devoted to the restoration of democratic institutions in Russia, were published (on Kasparov.ru, Grani.ru, and others). It is important to note, that in Russia, V. Linderman has not had any civil or criminal charges levied against him. It is no secret that activists and participants of The Other Russia coalition are constantly persecuted by the law enforcement agencies in Russia over their political and human-rights activities. It seems to us, that the fortune of V. Linderman (in particular, that he was refused Russian citizenship, as well as the constant violation of his rights and persecution in Russia), is directly connected with the attitude of the Russian clandestine services. As an example, it is worth noting certain facts: In 2003, V. Linderman was arrested by the FSB when he was planning to meet his 80-year-old mother, who came specially from Riga (he did manage get to see her then). In 2005, officers of the Ministry of Internal Affairs detained V. Linderman when his daughter came from Riga. We retain hope, and ask that the fortune and case of Vladimir Ilyich Linderman be decided conscientiously, impartially and in a balanced way. We ask that you take into account that V. Linderman’s elderly mother, wife and four children, who he has not seen for several years, reside in Latvia. We ask that you also take into account the persecution of V. Linderman over his political activities and views, on the part of the Russian clandestine services. We once again express our hope in your impartiality.